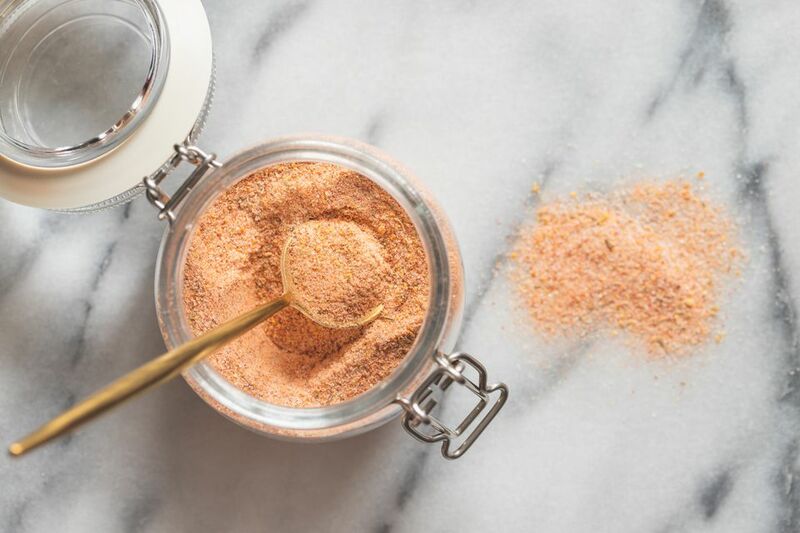 Use this seasoned salt as a table salt, or use it in any recipe that calls for seasoned salt or other seasoning blends, such as a salted Cajun seasoning. It can help add flavor to an otherwise bland soup, stew, or skillet dish. It would be great on oven-baked french fries and roasted pecans, in fried chicken batter and meatloaf or hamburger mix, and rubbed onto the skin of a whole chicken or turkey. It is also the perfect finishing touch for grilled fish or roasted vegetables. Sprinkle some on a roast, or use it to add zesty flavor to roasted potatoes or root vegetables. Homemade spice mixes make great gifts, too! Put all ingredients in a mini food processor, spice or coffee grinder, or small blender container and process on low speed until the mixture is fine and well blended. Make sure to check the expiration dates on your herbs and spices before you add them to the seasoned salt blend. For even fresher, more intense flavor, buy whole dried spices and grind in a spice grinder. For the freshest seasoned salt blend, store in a tightly covered glass or metal tin for best flavor. You can also scale up the recipe and give seasoned salt as gifts. Fill portions into decorative jars or tins and seal well. This seasoned salt blend does not call for any black pepper but you can easily add 2 tablespoons of freshly ground black pepper if desired. For a spicier blend, add about 1/2 teaspoon of cayenne pepper. Double the garlic powder for more garlic flavor. For a simple 6-ingredient seasoned salt blend, combine 6 tablespoons of salt, 1 tablespoon freshly ground black pepper, 2 teaspoons of sweet paprika, 2 teaspoons of garlic powder, 1 teaspoon of onion powder, and 1/2 teaspoon of cayenne pepper. If you are looking for an even more basic recipe, try a mixture of salt, onion powder, white pepper, garlic powder, and paprika.